The diatom Cyclotella cryptica was grown under low- and high-intensity white light of 50 and 500 µmol photons m2 s1, respectively. Western immunoblotting showed that the diatom adapted its light-harvesting apparatus, giving rise to different amounts of distinct fucoxanthin chlorophyll a/c binding polypeptides (Fcp). The amount of Fcp2 was approximately two-fold higher under low-light than under high-light conditions, whereas the amount of Fcp6 increased four- to five-fold under high-light conditions. For Fcp4, no significant differences were detected in response to either light regime. 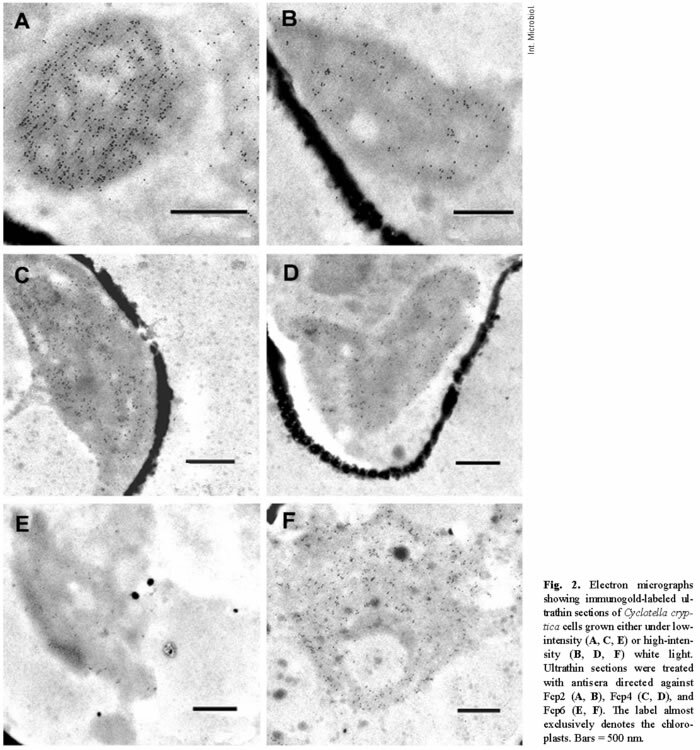 Cells of Cyclotella grown under high- and low-light intensity were subjected to immunoelectron microscopy. Quantification of the gold label, expressed as gold particles per µm2, confirmed the results obtained by Western immunoblotting. Exposure to low light resulted in the detection of approximately six times more Fcp2-bound gold particles per µm2 in thylakoid membranes, whereas in cells grown under high light the number of Fcp6-bound gold particles increased ten-fold. For Fcp4, similar amounts of gold particles per µm2 were counted under the two light regimes. These immunocytochemical results confirmed molecular data derived from phylogenetic analyses of the sequences of genes encoding fucoxanthin chlorophyll a/c binding polypeptides (fcp genes) and from measurements of steady-state fcp mRNA concentrations. The results show that Fcp2 and Fcp6 accumulate under low- and high-light intensity, respectively, whereas Fcp4 seems to be constitutively synthesized. [Int Microbiol 2006; 9(1):29-36]. La diatomea Cyclotella cryptica se cultivó a intensidades de luz blanca baja y alta (50 y 500 fotones m2 s1 µmol, respectivamente). La inmunotransferencia mostró que la diatomea adaptó su aparato captador de luz, produciendo cantidades diferentes de polipéptidos de unión a la fucoxantina clorofila a/c (Fcp). A intensidad baja de luz, la cantidad de Fcp2 era aproximadamente el doble que a intensidad elevada, mientras que a intensidad elevada la cantidad de Fcp6 era de cuatro a cinco veces la cantidad producida a baja intensidad. No se detectaron diferencias significativas para Fcp4 como respuesta a ninguno de los dos tipos de luz. Las células de Cyclotella cultivadas a intensidades alta y baja de luz se observaron por microscopia immunoelectrónica. La cuantificación del marcado de oro, expresada como partículas de oro por µm2 confirmó los resultados obtenidos por inmunotransferencia. Tras la exposición a luz de baja intensidad se detectaron aproximadamente seis veces más partículas oro unidas a Fcp2 por µm2 en las membranas de los tilacoides, mientras que en las células cultivadas a intensidad elevada, el número de partícula de oro unidas a Fcp6 aumentó diez veces. Para Fcp4, se contaron cantidades similares de partículas oro por µm2 en los dos regímenes de luz. Estos resultados immunocitoquímicos confirmaron los datos moleculares derivados de los análisis filogenéticos de las secuencias de los genes que codifican los polipéptidos de unión de la fucoxantina clorofila a/c (genes fcp) y de la medida de las concentraciones de mRNA fcp en el estado estacionario. Los resultados demuestran que Fcp2 y Fcp6 se acumulan, respectivamente, a intensidades de luz alta y baja, mientras que Fcp4 parece sintetizado de manera constitutiva. [Int Microbiol 2006; 9(1):29-36]. A diatomácea Cyclotella cryptica foi cultivada sob intensidade baixa e alta de luz blanca (50 e 500 fótons m2 s1 µmol, respectivamente). A inmunotransferência mostrou que a diatomácea adaptou seu aparelho captador de luz, produzindo quantidades diferentes de polipéptidos de união à fucoxantina clorofila a/c (Fcp). Sob intensidade baixa de luz, a quantidade de Fcp2 foi aproximadamente o dobro em relação à intensidade elevada, enquanto sob intensidade elevada, a quantidade de Fcp6 foi de quatro a cinco vezes maior do que a quantidade produzida sob baixa intensidade de luz. Não foi detectada diferença significativa para Fcp4 como resposta a nenhum dos dois tipos de luz. As células de Cyclotella cultivadas sob intensidades alta e baixa de luz foram observadas por microscopia immunoelectrônica. A quantificação do marcado de ouro, expresso como partículas de ouro por µm2 confirmou os resultados obtidos por inmunotransferência. Após exposição à luz de baixa intensidade foram detectadas aproximadamente seis vezes maispartículas ouro unidas a Fcp2 por µm2 nas membranas dos tilacoides, enquanto nas células cultivadas sob intensidade elevada o número de partícula de ouro unidas a Fcp6 aumentou em dez vezes. Para Fcp4, foram contadas quantidades similares de partículas ouro por µm2 nos dois regimes de luz. Estes resultados immunocitoquímicos confirmaram os dados moleculares derivados das análises filogenéticas das seqüências dos genes que codificam os polipéptidos de união da fucoxantina clorofila a/c (genes fcp) e da medida das concentrações de mRNA fcp no estado estacionário. Os resultados demonstram que Fcp2 e Fcp6 se acumulam, respectivamente, sob intensidades de luz alta e baixa , enquanto Fcp4 parece ser sintetizado de maneira constitutiva. [Int Microbiol 2006; 9(1):29-36]. The light-harvesting complexes (LHCs) of photosynthetic eukaryotes function mainly in the absorption and transfer of light energy to the reaction centers of the two photosystems, photosystem I (PS I) and photosystem II (PS II) [6,7,11,12]. The LHCs of green plants have been well studied. They harbor chlorophyll (chl) a, chl b, and lutein, and are referred to as Cab (chl a/b) or LHC proteins. Some LHC-like proteins, such as PsbS, Elips, and LI8I8 of Chlamydomonas eugametos, are expressed in response to excessive light and play a role in photoprotective mechanisms, preventing the reaction centers from photodamage [5,7,17,18,26]. Typical LHC proteins may also be involved in photoprotection. In these cases, the main mechanisms are via the xanthophyll cycle and photophosphorylation of LHC subunits [e.g., 14,19]. Despite the fact that chromophytic algae (i.e., diatoms and brown algae) play an important role in aquatic ecosystems, our knowledge of their LHCs is still rather fragmentary. The LHC subunits of most chromophytic algae contain chl a, chl c, and fucoxanthin, and are known as Fcps (fucoxanthin chlorophyll a/c binding proteins) [7,11]. That Fcps function in photoprotection has been demonstrated by the presence of xanthophyll cycles in chromophytes [8,16,29], but it remains unclear whether chromophytic algae express distinct Fcps in response to excessive light. From the centric diatom Cyclotella cryptica, eight cDNA clones harboring genes encoding fucoxanthin chlorophyll a/c binding proteins (fcp genes) were previously cloned and analyzed [1-3]. Phylogenetic analysis revealed that three genes, fcp6, fcp7, and fcp12, showed homology to the light inducible Cab-like protein LI8I8 of Chlamydomonas , and that they may represent Fcp candidates involved in photoprotection. In subsequent experiments, the steady-state fcp mRNA concentrations of C. cryptica, grown under low- or high-intensity white light, were quantified. The results showed that fcp6 and fcp12 mRNAs were enriched under high-light and fcp2 and fcp4 mRNAs under low-light conditions [20,21]. The current work focuses on whether the different expression patterns seen in the steady-state mRNA concentrations finally become manifested in varying amounts of the corresponding gene products within the plastids. This was determined by using Western immunoblotting and ultrathin sectioning/immunogold labeling to measure the relative abundances of Fcp2, Fcp4, and Fcp6 of C. cryptica grown under low- and high-intensity white light. Culture growth and cell preparation. Cyclotella cryptica (strain 1070-1) was obtained from the "Sammlung von Algenkulturen" at Göttingen (SAG) . The diatom was grown in Cyclotella medium according to the method of Werner , as described by Rhiel et al. . For the light-intensity experiments, C. cryptica cells were diluted into fresh medium and exposed to white light of either 50 or 500 µmol photons m2 s1. The illumination schedule of 12:12 h light-dark cycles and a temperature of 20°C were kept constant for both light regimes. In order to avoid nutrient limitations, the cultures were diluted after one week with equal volumes of Cyclotella medium. After an additional week, the cells were harvested by centrifugation for 10 min at 2500 rpm using a Sorvall RC-5B refrigerating centrifuge and a Sorvall A6/14 fixed-angle rotor. The pelleted cells were subjected to SDS-PAGE and to ultrathin section/immunogold-labeling electron microscopy. Gel electrophoresis and Western immunoblotting. Total cell protein of C. cryptica was analyzed by SDS-PAGE, according to the method of Laemmli , using 17.5% separating gels and 5% stacking gels. Equal amounts of total chl (chl a + chl c) were loaded onto the gels. Samples were prepared by resuspending the pelleted cells in small amounts of TE buffer (10 mM Tris/HCl, pH 7, 1 mM EDTA). Defined amounts, generally 10 or 20 µl, were used to estimate the chl (a + c) contents. Appropriate amounts of sample buffer were then added to yield a final concentration of 4 µg chl/ml. The protein-containing samples were boiled for 2-4 min at 100oC, and 50 µl, equivalent to 200 ng chl, were loaded onto the gel. Western blotting was carried out in a Biorad Trans-blot SD semidry transfer cell according to the method of Towbin et al. . The proteins were transferred onto Protran nitrocellulose transfer membrane (Schleicher & Schuell, Dassel, Germany) at a constant voltage of 20 V for 1.5 h. For immunodecoration, the blots were preincubated for 2 h in TBS-buffer (10 mM Tris-HCl, pH 7.5, 50 mM NaCl) saturated with skim-milk powder and washed in TBS, followed by decorating with the first antibodies [serum-diluted 1:1000 in TBS with 1% (w/v) bovine serum albumin (BSA)] for 2-16 h. Antibodies raised against the C-termini of distinct Fcps of Cyclotella cryptica were described in Westermann and Rhiel . After several washings with TBS, the nitrocellulose membranes were incubated for 2 h with peroxidase-conjugated goat anti-rabbit IgG (diluted 1:1000 in TBS with 1% BSA), provided by Sigma (Munich, Germany). The membranes were washed again and stained with 4-chloro-1-naphthol and H2O2. Images of the blots were recorded with a Herolab EASY CCD camera (type 429K) in an illumination chamber (Herolab RH-3) and stored as digitized files. The results were documented using the enhanced analysis system EASY (Herolab, Wiesloch, Germany). For quantitative investigations of the immunodecorated protein bands, the EASY Image Plus software package was used. Spectroscopy, pigment extraction, and pigment estimation. Pigments were extracted with 90% (v/v) acetone and the concentrations of chl a and chl c concentrations were estimated in a U-3000 spectrophotometer (Hitachi, Tokyo, Japan) according to the equations of Jeffrey and Humphrey . Ultrathin section/immunogold-labeling electron microscopy. For ultrathin sectioning and immunogold-labeling experiments, the pelleted cells were fixed at 4°C for 2 h in 0.1 M Na-K-phosphate buffer, pH 7, containing 4% glutardialdehyde. Excess glutardialdehyde was removed by washing the cells with 0.1 M Na-K-phosphate buffer, pH 7. The cells were then dehydrated in ethanol and embedded in Lowicryl K4M at 4°C, according to the manufacturer's specifications (Chemische Werke Lowi, Waldkreuzburg, Germany). The samples were polymerized by UV radiation for 24 h at 4°C and for an additional 48 h at room temperature. Ultrathin sections were cut with a Reichard-Jung Ultracut ultramicrotome. The sections were immunogold-labeled for 1 h using preimmune sera and antisera in dilutions of 1:100, according to the procedure of Rhiel et al. , and a 1:100 diluted solution of the second gold-conjugated antibody (goat anti-rabbit IgG with 10 nm gold, British Biocell International, Cardiff, UK). Finally, the sections were examined in a Zeiss EM 109 operated at 50 kV or in a Zeiss EM 902A electron microscope operated at 50 kV. A post-staining step was omitted. Photographs were taken on negative films (Zeiss EM 109) or as digitized images (Zeiss EM 902A) using a digital camera (Proscan High Speed SSCCD camera, 1kx1k, Proscan elektronische Systeme GmbH, Lagerlechfeld, Germany). The digital camera was operated by the SIS Esivision, Version 3.1 (Soft Imaging System GmbH, Münster, Germany). The images were stored as digitized files (tiff-formatted). Measurements of the gold-particle density were made on positive prints enlarged 58,500×. The number of gold particles was counted within defined areas, selected arbitrarily in the region of the plastids or in the cytoplasm. A minimum of ten areas from ten different positive prints was counted. Western immunoblotting. C. cryptica was grown for 2 weeks under low- or high-intensity white light, harvested by centrifugation, and subjected to SDS-PAGE. Equal amounts of total chl were loaded onto the gels, which allowed estimation of the relative abundances of the distinct Fcp subunits under the two light regimes. The three antisera specifically immunodecorated protein bands with relative molecular mass (Mr) of 18,000 (Fcp2), 18,000 (Fcp4), and 22,000 (Fcp6) in both low- and high-intensity white-light-treated cells (Fig. 1). Quantification of the immunodecorated bands revealed that the amount of Fcp2 was approximately twice as high in low-light-grown cells than in cells grown in high-intensity white light. The amounts of Fcp4 were almost the same under the two light regimes, whereas for Fcp6 an approximately four- to five-fold higher signal was registered for cells grown under high-intensity white light. Ultrathin sectioning and immunogold labeling. Ultrathin sections of chloroplasts of C. cryptica immunogold-labeled with the three antisera and preimmune sera are shown in Figs. 2 and 3, and the quantitative data are compiled in Table 1. The highest counts of gold particles per µm2 plastid area were obtained with antiserum against Fcp2, followed by antiserum against Fcp4. Antiserum raised against Fcp6 yielded the lowest densities of gold particles (Table 1). For all three antisera, no differences concerning the allocation of gold particles could be detected. In addition, the particles were not restricted to thylakoids of the plastid center or periphery (girdle lamellas), but were instead distributed randomly within the plastids. Gold labeling of cells grown under low light and then probed with antiserum against Fcp2 was approximately six-fold higher than that of high-light-grown cells (Table 1). Antiserum directed against the C-terminus of Fcp4 gave rise to similar gold-labeling densities; 180 ± 52 and 197 ± 48 gold particles per µm2 plastid area, for cells grown under low- and high-intensity white light, respectively (Table 1). When cells were probed with antiserum against Fcp6, the density of gold particles per µm2 plastid area was approximately 10- to 12-fold higher in cells grown under high-intensity white light than in those grown under low-light conditions (Fig. 2E, F, Table 1). All values measured within the chloroplasts significantly exceeded those measured within the cytoplasm. The number of gold particles per µm2 in cytoplasm ranged from 11 ± 5 to 0 (Table 1), which was similar to the number of particles counted on immunogold-labeled ultrathin sections treated with preimmune sera (Fig. 3, Table 1). Generally, rather low amounts of gold particles were counted in both plastids and cytoplasm when the preimmune sera were used. The exception was the preimmune serum of Fcp4, which resulted in a significantly higher amount of labeling within the chloroplasts than in the cytoplasm (Fig. 3C, D, Table 1). The results obtained in the current work using the three monospecific antisera confirm this assumption and show that Fcp2 expression is higher in response to moderate light, whereas Fcp6 is specifically induced in response to high-intensity white light. The results for Fcp2 and Fcp6 are in line with data on the steady-state mRNA abundances measured for fcp2 and fcp6 [20,21]. Gene fcp2 was expressed at a higher level under low-light conditions, whereas the steady-state mRNA concentration of fcp6 increased under high-intensity white light. Interestingly, the steady-state mRNA concentration measured for fcp4 was higher under low light and decreased under high light. This difference does not become manifested with respect to the abundance of the protein, Fcp4, and can be interpreted as demonstrating that the turnover rate of fcp4 mRNA exceeds the translation rate. The specific induction of Fcp6 in response to high-intensity white light supports a role for Fcp6 in photoprotection, as also suggested by phylogenetic studies, in which fcp6, fcp7, and fcp12 of C. cryptica showed homology to Fcp of the haptophyte Isochrysis galbana and to the light-inducible proteins LI818r3 and LI818 of Chlamydomonas reinhardtii and Chlamydomonas eugametos, respectively . Ultrathin sectioning and immunogold labeling. The overall ultrastructure of low- and high-light grown cells of C. cryptica was previously described in detail by Janssen et al. , and confirmed in the current study. Several small chloroplasts, comprising approximately 35% of the sectioned area of cells, were the dominating organelles in low-light-grown cells. The chloroplasts were densely packed with thylakoid membranes, which, as known for diatoms, were predominantly arranged in groups of three. When cultured under high-intensity white light, the area covered by vacuoles increased whereas the chloroplast area was reduced to 12-18% of the total cell area sectioned. The thylakoid membranes remained arranged in groups of three, but the overall amount of thylakoids was reduced significantly. Similar results were described by Rosen and Lowe in the diatom Cyclotella meneghiniana , in which the chloroplast volume and thylakoid surface density decreased in response to simultaneous light and nutrient stress. In the current study, nutrient stress was excluded as the cause of the observed morphological changes, as the medium was changed after one week of growth under low- and high-intensity white light. Similarly, Pyszniak and Gibbs  used immunogold labeling to localize the fucoxanthin-chlorophyll a/c light-harvesting complex in the diatom Phaeodactylum tricornutum. They found an equal distribution of the complex in appressed and non-appressed thylakoid membranes. Comparison of Western immunoblotting with ultrathin sectioning and immunogold labeling. While the same tendencies were observed in Western immunoblotting and immunogold-labeling experiments, quantitative measurements of the signal intensities on immunodecorated blots and of gold particles per µm2 deviated by a factor of 2-2.5. This might have been due to the different experimental approaches. Hust et al. attempted to quantify Western immunoblots of sediment samples that had been extracted with SDS loading buffer. The authors stepwise diluted the extracts with the buffer and obtained fractions with decreasing chl a and protein concentrations. SDS-PAGE followed by Western immunoblotting gave rise to blots in which the signal intensities were almost linear in the chl a concentration range of 100-20 ng, but the curve flattened somewhat at higher chl a loads. An additional explanation may be found in the Western immunoblotting protocol, since prolonged development of the blots with 4-chloro-1-naphthol and H2O2 might lead to excessive staining. As a result, the signal intensity would saturate with increasing time of immunodecoration. Incubation with Fcp4 preimmune serum resulted in significantly higher labeling than obtained with the other preimmune sera. 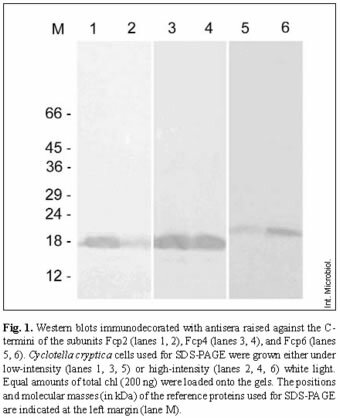 Although the amount was still four-fold lower than that registered for Fcp4 antiserum, it indicates that the rabbit must have raised immunoglobulins against a distinct plastidal protein prior to immunization with the oligopeptide corresponding to the very C-terminal amino acid sequence of Fcp4. Westermann and Rhiel  showed that none of the three preimmune sera taken prior to the first immunization gave rise to a signal on nitrocellulose membrane blotted with total cell protein extracts of C. cryptica. Plastidal labeling with the Fcp4 preimmune serum therefore might have been caused by a protein present in minor amounts within the chloroplasts of C. cryptica. 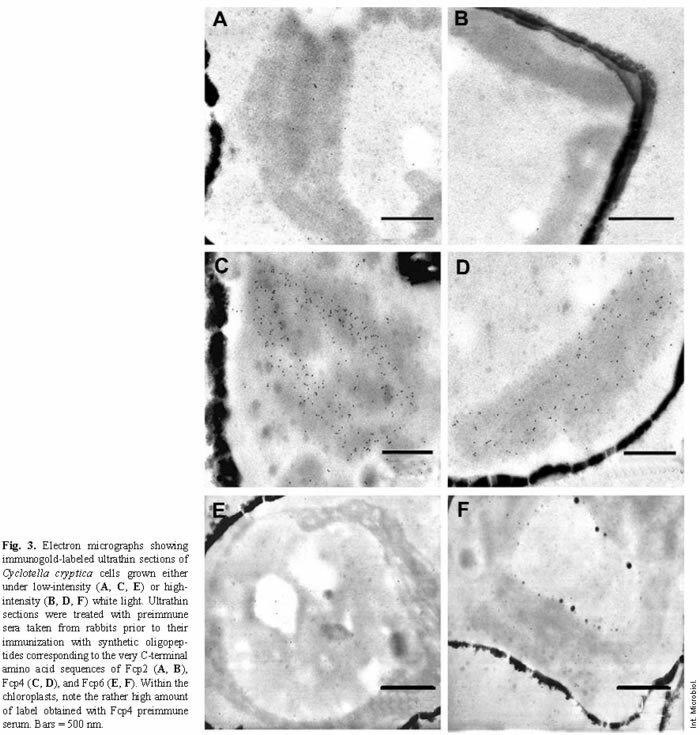 Westermann and Rhiel  tested the three antisera in immunogold-electron microscopy of both ultrathin-sectioned cells and freeze-fracture replicas of thylakoid membranes of C. cryptica grown under low-intensity white light. The antisera densely labeled the chloroplasts in a manner that was specific for and restricted to the thylakoid membranes. Thylakoid membranes that had been cut superficially rather than at a right angle to their planes showed a rather patchy distribution of gold particles, with areas of higher or less-dense labeling. For each of the three antisera, approximately ten-fold fewer gold particles were visible outside the chloroplast in the cytoplasm, indicating either unspecific background labeling or confirming the observation that Fcps are nuclear-encoded . Estimations of the label density per plastid area indicated nearly equal amounts of gold particles per µm2 plastid area for Fcp2 and Fcp4, but an eight- to ten-fold reduction for Fcp6 . In a previous report , enumeration of gold particles observed in photographs yielded values of 1681 ± 784, 1995 ± 422, and 208 ± 151 gold particles per µm2 for Fcp2, Fcp4, and Fcp6, respectively. These values are higher than those measured in the current work and are most probably due to the fact that: (i) fresh cells of C. cryptica were embedded, (ii) different batches of preimmune sera, antisera, and gold-conjugated second antibodies were used, and (iii) different persons participated in the previous and recent experiments. Concluding remarks. Western immunoblotting and ultrathin sectioning/immunogold labeling together provide strong evidence for the light-regulated expression of distinct Fcp subunits: fcp6 mRNA transcription is induced and its gene product, Fcp6, was synthesized in high amounts when C. cryptica was cultured in high-intensity white light. By contrast, transcription and translation of fcp2 were enhanced when C. cryptica was grown in low-intensity white light. Therefore, it is expected that Fcp6 is involved in photoprotection, whereas Fcp2 most likely plays a role in harvesting light energy under light-limiting conditions. Currently, experiments are in progress to isolate Fcp2 and Fcp6 in their native states. It will be interesting to determine which pigments, especially carotenoids, are attached to the protein backbones and how they function in photoprotection/light-harvesting. Additional experiments will be aimed at identifying the photosystem (PSI, PSII, or both) to which Fcp6 and Fcp2 are bound, and whether this association occurs in addition to the attachment of the existing antenna or whether the latter are able to replace distinct Fcps. The authors express their gratitude to Ms. Renate Kort, Ms. Heike Oetting, and Mr. Michael Pilzen for technical assistance. The financial support of the Deutsche Forschungsgemeinschaft (Rh 20/3) is gratefully acknowledged. We hereby declare that the experiments comply with the current laws of Germany.